CHICAGO (WLS) -- A man tried to lure two young girls by offering them candy in Chicago's Austin neighborhood, police said. 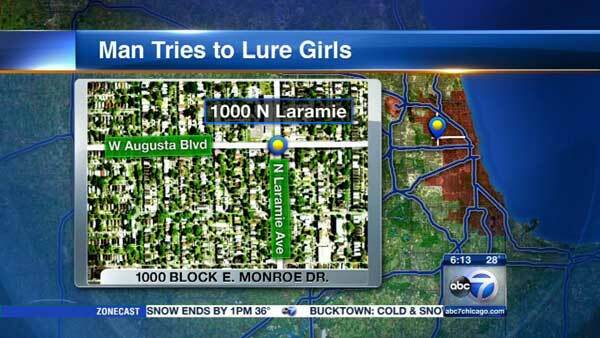 A 9-year-old girl and her 6-year-old sister were walking in the 1000-block of North Laramie Avenue around 4:45 p.m. on March 19. They had just left Hay Community Academy's after school program. They told police a tall man standing next to a white van said, "Hi girls, do you want some candy?" The girls went back to the school and told staff members what happened. When they went outside to check, the man and the van were gone. Police said the man was wearing sunglasses, a black hat, a black hooded sweatshirt and black pants. Anyone with information regarding this incident should contact Area North detectives at (312) 747-8266.